G'Day Tragic here... . .
Ok... I have finally gotten around to releasing my version of a Call of Cthulhu Plugin for LackeyCCG!! There is not a lot to talk about here, this is a much simpler plugin than my Lord of the Rings one. All errata has been photoshoped directly onto the cards scans. All restricted cards are watermarked with a small icon to denote their restriction. In addition to all the various Story Cards, I have added all the CCG Story Cards. There are premade story card decks for each set as well as a "All" set. There are domain cards for use in addition to the tokens. I have sent all the card scans to the dude managing the OCTGN plugin, I do not know if he will be updating that version. Also there will be a incoming MOd of Tabletop Simulator. • Open the applicatio and click the button at the top (send from teh far right) called "PLUGIN"
• Press the button in Lackey "Paste AutoUpdate URL". 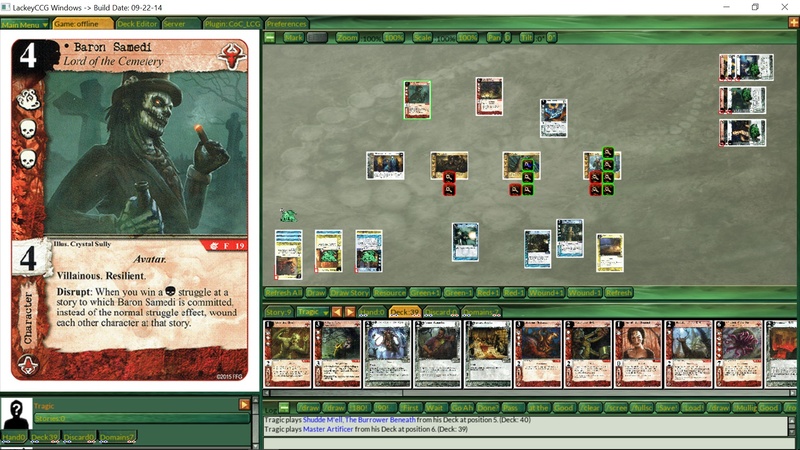 • Then click "Install Update"
This plugin and the coming Tabletop Simulator plugin (I ma having some trouble contacting OCTGN guy) has been done for soon I will be launching the Call of Cthulhu LCG Online League! Stay Tuned and go subscribe to the BGG guild to keep updated as more info comes out! Installing now to check things out. Thanks for making this happen! Also, I'll be trying to recollect the places I've mentioned playing Cthulhu on Lackey and updating them to point to your new plugin. Thanks so much for sharing this,I have paste the link and try to install it,but it just says the error time out while updating the plugin, do u have any idea how I can solve this? What I can do is change the pluging to be a single ZIP file that people can download and install manually.. but this will mean the "autoupdate" features will no longer function. When I get time I will re-do the plugin as a zip. I am now hosting on GITHUB.... . I think this will work fine.. but there is a bandwidth limit.. so if you have errors.. just wait and try again in a few hours or the next day or something. I do not think it will ever be an issue as there are so few people who will use this plugin. I found github super confusing as it is a complex site designed for subversion control and group access of programming projects... so let me know if there are any issues! Thanks for keeping the plugin alive, Tragic. Never would have thought of Github as a possibility. Well played!